We might not have stopped here had the weather gods deemed a direct voyage to New Caledonia more fitting, but sitting here in the lagoon on a perfect winters day we are so happy that we decided to stop at Lord Howe on the way. Words cannot convey the spectacular beauty of this place, the intimidation of the majestic sheer heights of Mount Lidgard and Gower sharply contrasting the welcoming aquamarine lagoon. From early this morning when the moonlit silhouettes of the mountains and Balls Pyramid came into view we have been enchanted. Coming in through North Passage shortly after sunrise, perfect lefts peeling down the reef alongside, we were already totally sold. Ashore there is an immediate captivating charm, a feeling of time slowed down, pretty green vegetation, quaint roads and buildings. Our experiences with the friendly policeman Simon and all other officials and locals we have encountered has further warmed us to the place, where there is an obvious sense of pride and community. Although not much further North than Sydney, the warm eddy of the Australian east coast current makes the weather here much milder than on the Australian mainland, with the water temperature quite friendly for this time of year. During the final stages of the boat work in Newcastle we started to look at the weather windows for the trip to New Caledonia using the PredictWind weather routing service we had subscribed to and familiarizing with using the Iridium Go and PredictWind software to download weather GRIB files. Fortunately there was a decent weather window to leave on Monday the 27th July, however the later stages of the trip to New Caledonia could be unpleasant with the possibility of winds turning North East. The South Westerly on the back of a big low pressure would be perfect for getting East to Lord Howe and we could arrive in good weather when the winds had faded and turned Easterly, which would make the lagoon a quiet haven (strong SW winds make for very rolly and rough conditions in the lagoon). After clearing customs we would struggle to make Lord Howe in daylight hours on Wednesday, so we planned to leave in the afternoon, take it easy and plan to arrive early Thursday morning. Such was the plan and all started quite well. After sad farewells to our friends, parents and beloved Silus (our dog could not come with due to difficulty returning to Oz), we headed out of the breakwater at about 3:30 PM and went straight to 3rd reef and full headsail in a moderate South westerly, which built to the forecast 20 to 25 knots as we cleared the coast. All good so far, but as we got out further into the east coast stream we started to experience the classic rough wind and waves against current conditions. It felt like about 30 knots over the water and we had quite large swells with the occasional breaking crest. Not really serious conditions, but enough to be a bit concerned, especially as we were a bit rusty at this stage having not sailed anywhere for a while. This went on for the whole night with us getting no sleep at all. It was still rough on Tuesday morning and we put up the staysail, furled the jib and dropped the main completely, which made things much more comfortable and the auto-helm more easily able to cope with steering. By midday Tuesday we had crossed the main east coast stream and in the back eddy towards Lord Howe the current had changed and become favourable with smoothing seas but still a big swell. We hoisted the main again and the boat was going really well with 3rd reef and staysail in a 20 knot Southerly, reeling along averaging about 9 knots over the ground with the odd 12+ surf. We elected to sail through the night with just staysail in order to try to get some sleep and to slow down to avoid arriving at night time. During the night the wind faded and we motor sailed and both got some good sleep. The favourable current continued and we spent Wednesday sailing with full sails in a light South Easterly, very pleasant sunny and the swell had eased considerably. Around mid-afternoon Wednesday we were just starting to feel really relaxed and happy with things, well rested, all was good. As is wont to happen in boating it is often just at these moments that something goes wrong. We discovered a largish amount of sea water in the bilges, in the front and the back of the boat. Not enough to be totally alarmed, but a concern nonetheless as the boat is usually really dry. This put a damper on things (literally) as we dried out the bilges, only to discover more water later. A potential candidate was the front bilge pump Jabsco one-way valve malfunctioning, so Bruce inspected it and we then plugged the pipe to eliminate that one. There appeared to be more water later, but it may have been lurking alongside the water tanks and worked its way out. The wind faded and headed on Wednesday night so we resorted to motoring with the mainsail (3rd reef) to stabilize the rolling a bit. 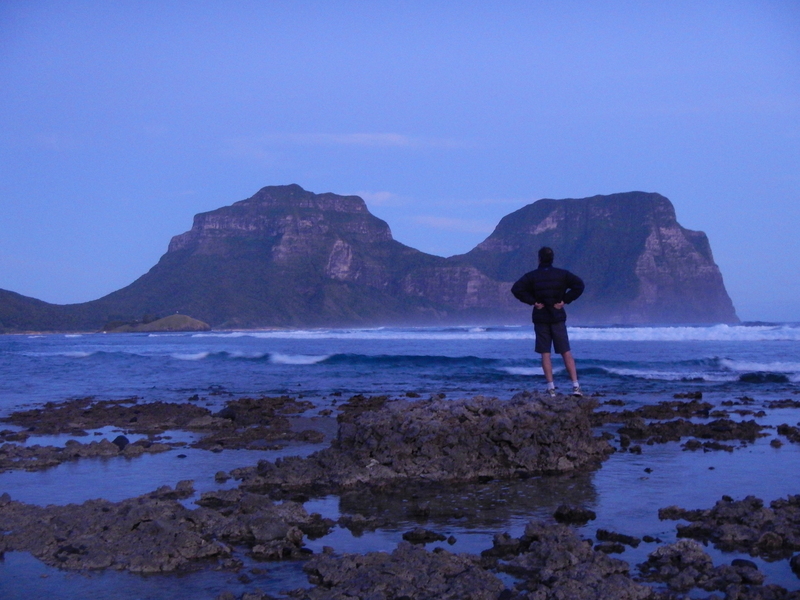 At the end of her watch at 2 AM, Lyn spotted the silhouettes of Lord Howe and Balls Pyramid in the moonlight. By 4 AM it was clear we would get there too early, so we hove-to (stopped) with 3rd reef and a tiny bit of headsail backed the wrong way. We both went to sleep for a couple of hours like this before motoring the final few miles to the North Passage entrance. Simon was really helpful and accommodating, talking us in explaining the leading posts and buoys and we were soon safely moored just inside North Passage. After arrival on Thursday we did a bit of a tidy up, drying the bilges etc. before heading ashore to meet Simon for the formalities. Very brief and easy and also with all the advice we wanted on facilities etc. We did a brief explore of the foreshore whilst picking up a key to the showers, had lunch at the Anchorage (starving) and a very welcome hot shower. Returning to the JoliFou we were overcome by tiredness and had an afternoon nap, waking for a quick trip over to North Bay at sunset. By Friday morning the forecast North Westerly had started to build. Bruce awoke his kitesurfing mojo and we headed to the main lagoon beach with kites, boards and Lyn’s Brompton folding bike. Lyn went for a ride around the island, discovering the beautiful beaches on the Western side. She also explored some of the charming shops doing some shopping and found an internet connection at the museum. Bruce had an awesome kite on the lagoon, heading down almost the full length and back upwind. A few sketchy moments with shallow reef as the tide went out, but a great place for it. Saturday was another day of perfect winter weather, sunny and light wind. We took the opportunity to break out the paddle boards and paddled all the way down to the South end of the lagoon, exploring the reef and Blackburn Island on the way. The water was spectacular and the coral quite beautiful, but we were disappointed by the lack of fish and other marine life. The lagoon is over 4 km long and by the time we had paddled back against a light North Westerly we were both physically buggered, neither of us being at a high level of fitness at the moment. After lunch and a bit of a lie down we took the dinghy ashore to Old Settlement Beach and climbed the track to Kim’s lookout where we enjoyed sunset beers. The scenery from here is breathtaking as you sit atop the high point of a sharp ridge. To the South you have the whole vista of the island and lagoon, with the imposing mountains as a backdrop, to the North there is a 182 meter sheer drop cliff below you straight into the ocean depths and the endless blue horizon. To the West, the sunset framed by Mount Eliza, to the East the pretty Noddy and Roach islands. 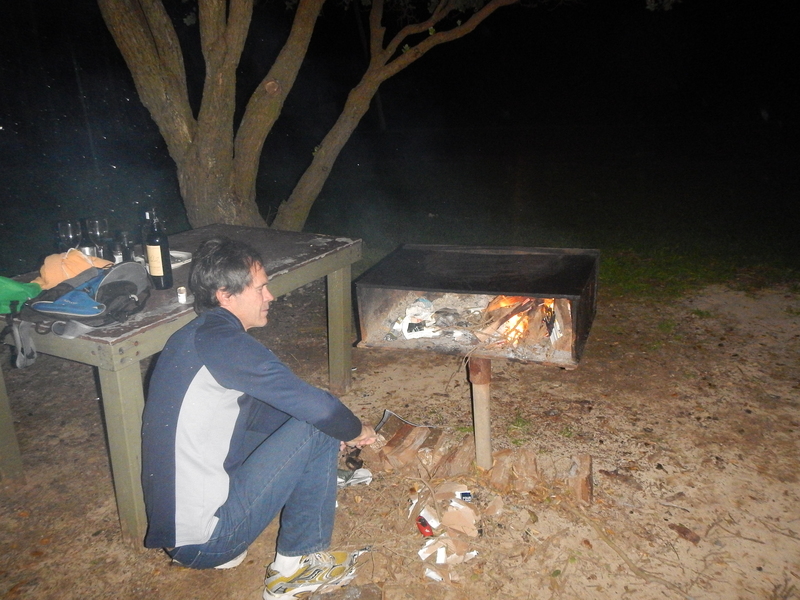 That night we went ashore with food and wine, walked over to Neds beach where we used one of the many public barbecue fires to cook a delicious meal of steak and vegetables. It was a perfect setting with the recently arisen moon illuminating the rocks and beach and the squawking of the sea birds filtering across from the islets. On Sunday we hired a bike for Bruce, and Lyn rode the Brompton as we did a bit of shopping chores and explored the island. The dinghy was running a bit low on fuel so this was the number 1 priority (nice planning on a Sunday). The only place to get petrol on the island is at Top Shop, so named (I presume) because it’s at the top of the hill, which didn’t make our mission easy. The whole Yamaha 25 liter fuel tank went on the back of the Brompton rather well and we rode and walked up to the shop. Fuel was pricy at $3 per liter, but that’s to be expected. 2 stroke oil from Thompson’s store completed the task. It’s testament to how organized the island is that we were able to achieve all of this on a Sunday. The shops here are small but oh so well stocked. The isolation and the need to get stock by way of the Island Trader ship has made the shop owners really good at knowing what is required and keeping appropriate supplies. Joy’s Shop in particular is an amazing general store where you can get virtually anything you may need, the variety of items is phenomenal. We visited the extremely pretty Blinky’s beach near the airport which has an excellent sandy expanse and looks like a good surfing venue in the right swell direction. Later we went for a walk on the South side of the island to Mutton Bird point and back. We had intended going further to Boat Harbour but our unfit legs were not in agreement. This track along the South East side of the island is really scenic (I think they all are) and Mutton Bird is impressive. Yesterday started badly as Sod’s law kicked in with a vengeance! Bruce was doing his morning check of the weather, downloading weather GRIB files on the PC when he plugged the PC charger into the 12 volt outlet at the chart table. A short time later he noticed smoke pouring out of the chart table console area!! Mad panic ensued, batteries turned off, fire extinguisher at the ready, pulling the console apart to find the source. Eventually the smoke subsided and we put 2 and 2 together and realized that it had to be something to do with the 12 volt plug. The plug and the PC plug were totally burnt and melted, along with some wiring behind the console. After some initial despair we finally figured out that the damage was thankfully confined to the two 12 volt outlets in the chart table region. Lyn went ashore to sort out admin and finances at the internet café (museum) and Bruce spent most of the day removing and replacing burnt wiring and repairing the system, this time with a fuse that will hopefully prevent recurrence of this event. On testing the new system all worked except the TV?? On closer inspection the end of the TV plug was missing and we found it in the molten plug socket, the ultimate cause of the issue was now apparent. When Bruce had removed the TV plug earlier the end of it had remained in the socket and plugging the PC charger in had caused a short circuit in the socket. We were relieved that the cause was explained (rather than just bad wiring) and we even managed to salvage the tip of the TV plug and screw it back into the plug (tightly). All back to normal, one day lost. We had considered leaving today as the weather is favourable, but we think it will be more settled and even better Tomorrow or Thursday so will keep an eye on it and decide later. Lyn is hopefully going to be able to post this later this morning. By jolifou in Uncategorized on August 3, 2015 . Looks so amazing. How do you get there if not for Jolifou? Happy travels. Hi Karen. You can fly there, but I think quite pricy and they limit numbers. I think weather can be a bit of a gamble in winter as many locals remarked on how nice the weather was “for this time of year”. Summer is the preferred time but would be a bit more crowded. Anyway, I would definitely recommend it.